Our Cash for Cans event was a huge success. We brought in about 45,000 cans, or 1,524 pounds in under 4 hours on Saturday, February 25. The biggest load was 372 pounds, the smallest was 4 pounds. We got a couple of new recyclers who were eager to learn what went where in the collections area, and everybody enjoyed the great food. Thanks to the Solid Waste District for providing sandwiches and the use of two strong and energetic employees for the event. We hope to use what we learned from this event to improve recycling rates in the area. Stay tuned for progress on that. 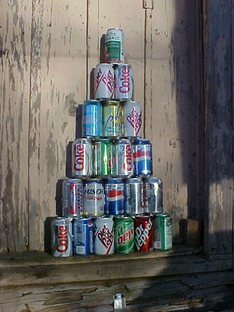 Cash for your aluminum cans! 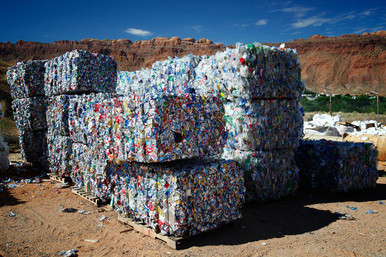 Moab Solutions will buy your aluminum cans on Saturday, February 25, from 10 a.m. to 2 p.m. only, at your Community Recycle Center, 1000 East Sand Flats Road, just past the Animal Shelter. Bring other items the center takes and be entered to win a $50 gift certificate to City Market and other great prizes! Check our recycling directory page for detailed information on items the center accepts. Scout troops, non-profits, churches, school clubs and individuals, you can raise money for your cause by collecting cans to sell to Moab Solutions. TIP! There are hundreds of aluminum cans littered along Spanish Valley Drive from town to the mountains and on all area roads. Add them to your collection! And while you're out there, grab some of the other recyclables and trash. Aluminum cans only. No pie plates or foil. Loads will be checked. We are paying 30 cents a pound. This is a one-time only event. Call Moab Solutions for details! The Emergency Shelter Solutions group is collecting money for the Emergency Shelter Fund. We work hard to move folks out of the camps and out from under the bridges to the inside during winter. You can give $5 (or more!) and help the homeless in Moab. 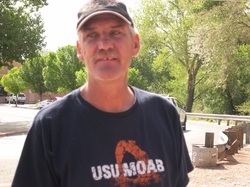 Zions Bank can take your donation, or you can mail it to Moab Solutions, PO Box 1549, Moab, UT 84532. You can print out the flyer below and start a challenge at your office or shop. 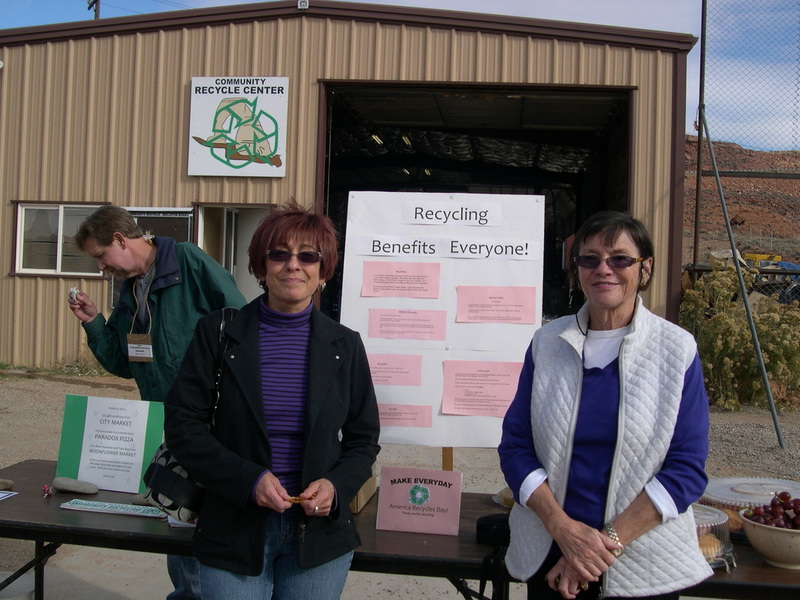 A great time was had by all at the recycle center on November 15 for America Recycles Day. (See info below.) We had loads of entries for our prizes and the winners were thrilled. Big thanks to the Tom Edwards and the Solid Waste District for their partnership and to Moonflower Market, City Market and Paradox Pizza for donating great prizes! Moab Solutions volunteers helped folks with their recycling and we kept all the collection containers clear of things that didn't belong. Thanks Carol Hoggard, Dave and Kay McLean, Dean and Breezy Nebergall, Ken Milliken, and David Morgan. One of the highlights was when a Brownie Troop came up to do some recycling. The girls were so adorable. We're looking forward to next year's event. Lenore and Suzanne love to recycle! Ken is in the back checking the number on a plastic container. Join us at your Community Recycyling Center as we celebrate recycling. Enter to win a prize, enjoy some snacks, get your recycling done, and join in on a volunteer project for a minute or two! From 1 p.m. to 5 p.m. Thank you Moonflower Market for donating a new tote bag and Klean Kanteen combo, Paradox Pizza for donating a pizza a week for a month and City Market for the $25 gift certificate! This is a Solid Waste Special Service District #1 and Moab Solutions project. For more information, call District Manager Tom Edwards at 260-9978 or Sara Melnicoff of Moab Solutions at 259-0910. We would love to have you join us! Happy ending: The person responsible turned themselves in. The person is doing work to try to make up for what they did. Check out this great piece in the Salt Lake Tribune by John Weisheit of Living Rivers. Update: The garden will live on in a new location this spring!